This recipe is an oldie, but goodie. If you’ve ever heard of the WASC cake, this is it, but with my spin on it. It’s super easy to mix together and bakes up the same every time. It starts with a box mix, but you add other ingredients, which really makes the difference. If you are hesitant to use a box mix, don’t be. They are so predictable, unlike a scratch cake…which is a good thing. I will admit, when I was taking cake orders, I used a scratch cake recipe. It was truly an awesome recipe, but I will tell you no matter how good you are, sometimes a scratch cake just doesn’t turn out the same every single time. This cake is a ‘no-worries’ cake and I use it as the base for my other cake flavors now. Try it out! I think you’ll love it. Oh, and it’s also great as cupcakes. So here’s my spin on the WASC cake. Instead of plain vanilla extract, I use vanilla bean paste. Yes, it really makes a difference. The next spin is that I use a tiny bit of almond emulsion. You’ll notice I didn’t say almond ‘extract’. There is a huge difference to me. I personally don’t care for almond extract, but using a tiny bit of almond emulsion combined with the vanilla extract will knock your socks off. Lately, some of you (as well as I) have noticed this cake isn’t baking up the way it’s supposed to. (Ex. the middles were sinking slightly and it just didn’t have as much bounce.) I initially thought it was because they lowered the amount of cake mix in each box. 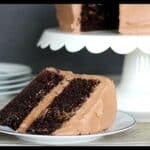 I did a little research online and it appears this is a problem a lot of people are having now with doctored box cake mixes. It appears that the cake mix companies have changed not only the amount included in the boxes, but the ingredients and that’s causing what was once a favorite recipe, to come out differently. I decided I’d do some experimenting and came up with something I think gets you closer to the original WASC recipe. The recipe card below reflects those changes, but here’s a short explanation: The first change is since there’s less mix in the box, I lowered the amount of water to only a cup. I was noticing (as well as another reader) that when I made this with whole eggs, it came out much better, so instead of 4 egg-whites, I’ve changed it to three eggs. Although, it won’t be a bright white cake, it now bakes up much better, since the cake mix formula was changed. I hope you try out these new suggestions and let me know how it goes. I’ve also found that this same recipe works wonderfully with other flavors. I just recently tried it with a Red Velvet cake mix and it was amazing. You also might want to check out my post about freezing cakes and cupcakes. There are lots of tips there to help you freeze them successfully. 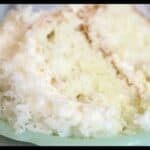 This is an easy white cake with a great vanilla flavor. It comes out great every time and is super quick to mix up. This recipe will make enough to fill two, eight inch round cake pans that are two inches deep. Preheat oven to 325 degrees. Grease or spray your pans. In another bowl, mix the remaining ingredients, then pour onto the dry ingredients. Beat on medium about two minutes. Scrape down the sides of the bowl, then beat for another one minute. Bake at 325 degrees for about 40 - 50 minutes. Set cake pans on wire rack to cool for 10 minutes, then turn out of the pans onto the wire racks to cool completely. The baked cake layers can also be frozen for later use. Nutritional information does not include icing. Just 2 questions. What size pans and just grease the pans, no flour? I use two, 8″ round pans that are 2″ deep. I usually just spray them really well with Pam spray, but if you don’t have that, I’d grease the pans and then sprinkle them with a light coating of flour. If you click on the word emulsion within the article, it should take you to an amazon link where you can purchase the almond emulsion that I use. I like LorAnns emulsions. You can also get them at crafts stores like Michael’s, Hobby Lobby or JoAnns. I’ve even found it at Walmart in the Wilton aisle (that’s usually in the craft area of Walmart instead of the baking aisle.) Its really amazing stuff and a little bit goes a long way. Have you made cupcakes with this recipe? How long would you bake for? I have made cupcakes with these but it’s been awhile. I would bake them for about 20 minutes. Start checking them at 15 though. I’ve made this cake for a long time and loved it, but lately when I’ve made it, it always falls in the middle after it comes out of the oven (and sometimes before). I use two oven thermometers so I know the oven is the correct temp, weigh the ingredients, use room temp ingredients, but it still falls. Any advice? Yes, I have noticed this as well, so you’re not alone. I started mixing the batter a little longer and it seemed to help a bit, but here’s what I think has happened: I think there is less cake mix in the boxes now. I have heard this from other cake forums as well. I’ve done a couple things that seem to help this. I’ve actually been meaning to set aside some real testing time on this one, so I can update the recipe to fit the new cake mixes. Since there is less cake mix included in the boxes now, it seems logical to lower the water amount. I would try it with only one cup instead of a cup and a third. The next thing is that it seems to sink in the middle more if you’re using the egg white version instead of whole eggs. You can try using two whole eggs instead of the four egg whites. 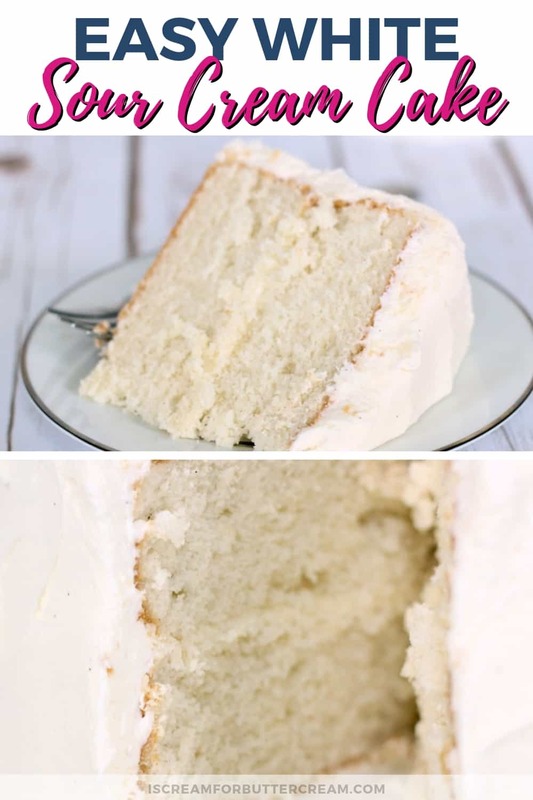 If you really want a white cake though and need to use egg whites, then lowering the amount of water I think will have the best results. I’ll plan on testing it out this weekend and see how that works…if it’s good to go, I’ll update the recipe and shoot you a response. I hope you got my previous reply to your comment. I went ahead and did a little more experimenting this past weekend and I’ve adjusted the recipe. I researched this a bit and it seems this is a problem with doctored cake mixes in general. They’ve not only lowered the amount of cake mix, but have also changed the formula a bit. I’ve noticed this more so on white cake mixes specifically. I’ve determined, in order to get the cake light and fluffy, it needs whole eggs, so I went with three whole eggs instead of four egg-whites. It won’t be a completely white cake, but it will come out much better. I also lowered the water to one cup. I wrote about the changes in the blog post and updated the recipe card there. I hope this helps! I absolutely LOVE this cake, as does my whole family AND office! I also love your site and detailed directions. I now freeze my cakes as in your instructional video, and they come out perfect every time! Thank you! So . . . my question . . . my mom wants a lemon cake for Mother’s Day. Do you think I could make this cake into a lemon cake by simply adding lemon juice/zest? If so, any ideas on quantities? Thanks again! Thank you so much for your suggestions, Kara. 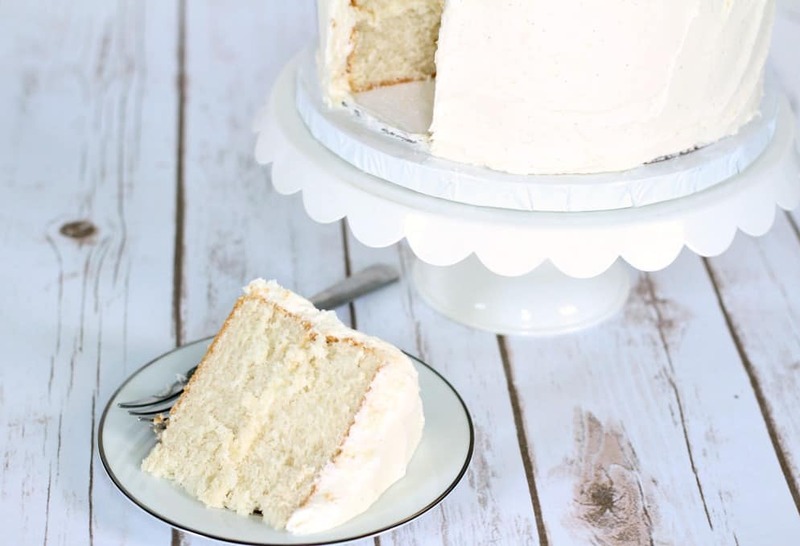 This Mother’s Day, I think I will try your Lemon Sour Cream Cake with Lemon Buttercream. I’ll give your other recommendation a try when I’m not baking for an “event” – just in case there are any hiccups. 🙂 Thanks again. 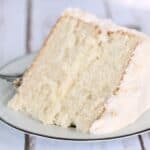 Everyone LOVED your lemon sour cream cake! I told all of my family members that they need to visit your website to make delicious cakes of their own. Thank you again for all of your help! Can you use milk in place of the water? Thank you. Hi Angela, I’m not sure. I’ve never tried it with milk instead of water. I’m sorry I’m not much help 🙁 If you try it out though, I’d love to know if it works well! Is there a way to turn this cake into a red velvet cake? Like can I just add a couple tablespoons of cocoa and some vinegar? I’d just try adding in about three tablespoons cocoa powder and then the red gel food coloring. I don’t know how the vinegar will affect the cake mix though. That’s usually just added to react with the baking soda in a scratch cake, so I wouldn’t necessarily add it here. Let me know how it works out! The vanilla paste is very expressive. Can I use 2 tsps of vanilla extract instead? Also, wondering why water instead of milk or buttermilk? Thank you! 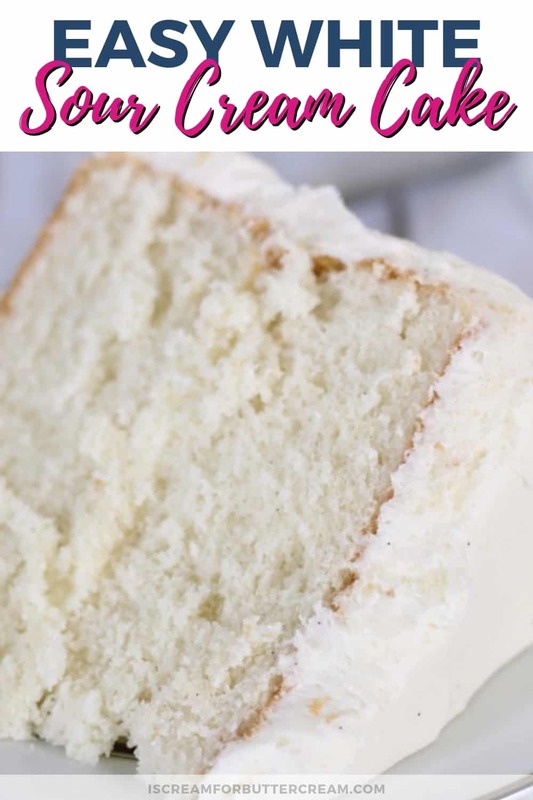 I’ve been looking for a good white cake recipe for ages. Hi Nancy, Yes, I’ve noticed the vanilla paste has really gotten more expensive lately. You can just use vanilla extract instead and using two teaspoons is fine. Sometimes you can find the Madagascar vanilla extract at the regular grocery store and that’s really good too and not as expensive as the paste. Thank you Kara Jane! I really appreciate your response to my questions. I love your website and all of your baking tips and tricks! 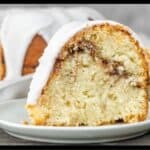 One question on this recipe, can it be converted to a strawberry cake using a strawberry box mix? If so, what alterations, if any, would you recommend? Oh thanks Kelly! Yes I think you could definitely convert this to a strawberry cake. 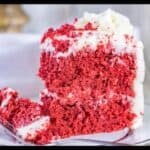 I would probably leave everything the same, but use a strawberry cake mix, then you could also probably add in a box of dry strawberry jello to pump up the strawberry flavor and maybe a bit of crushed strawberries (but not too much though because you don’t want too much liquid added). I haven’t tested this out, but I’m thinking it should work just fine. Let me know if you try it out!